We are a Partner with the best Rental Companies in the world, at no extra cost to you. You get the Ride Free personal service and Package, and our Rental Partners for the price of one. Most rental companies maintain a 3 million dollar liability insurance coverage at all locations. All insurance, coverage and waivers are subject to the express terms and conditions of the rental contract and do not include coverage for injury, personal property, or damage as the result of negligence such as illegal use or use of rental while under the influence of drugs or alcohol. Clients are required to contact the rental company pick-up station and file a Police Report within 48 hours of any damage or accident. Any damages to rented motorcycle without a police report is considered Renter’s fault. 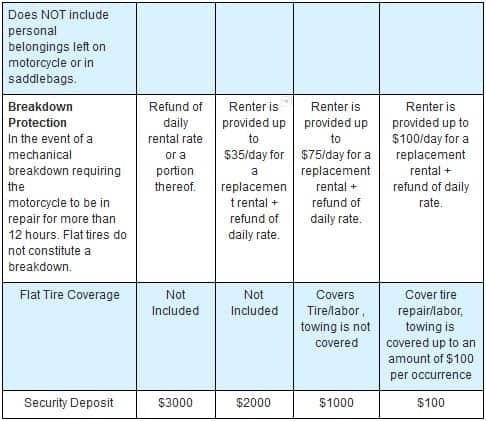 Roadside Assistance Coverage provides towing and roadside assistance by the rental company approved vendor if your motorcycle becomes inoperable. The benefits include emergency road service towing, emergency fuel delivery and jumpstart services. In accepting this coverage we will waive the cost of an approved tow or roadside service. Roadside Assistance Coverage provides towing and roadside assistance by the rental company approved vendor if your motorcycle becomes inoperable. The benefits include emergency road service towing (within 30 miles of occurrence) emergency fuel delivery (up to 2 gallons) and jump start services. In purchasing the Roadside Assistance Coverage, we will waive the cost of any approved tow or road side assistance service up to the amount of $500 USD per incident. (*) E-VIP-Zero is only available at participating locations and for rental periods of at least 3 days. At any time prior to Renter picking-up a Vehicle, the Rental Company, at its sole discretion and for any reason, may cancel any E-VIP-Zero protection purchased by a Renter. 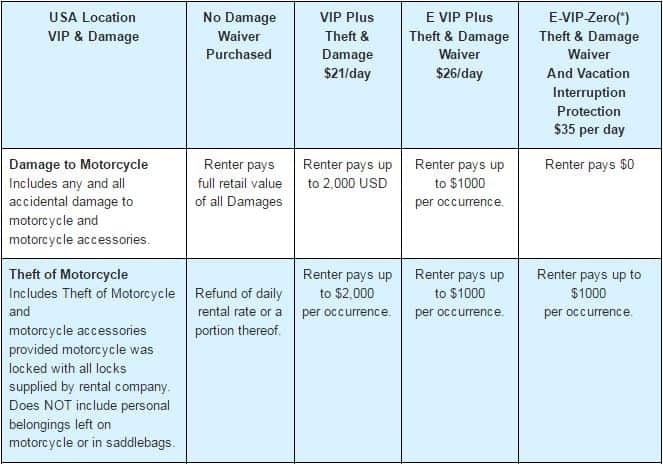 Upon any such cancellation, unless otherwise notified by the Renter, in writing, the Renter shall be deemed to have elected to purchase the E-VIP protection described above and The Rental Company shall refund to Renter the difference between the costs of the two protections. Waiver is vacation interruption protection and is not insurance. 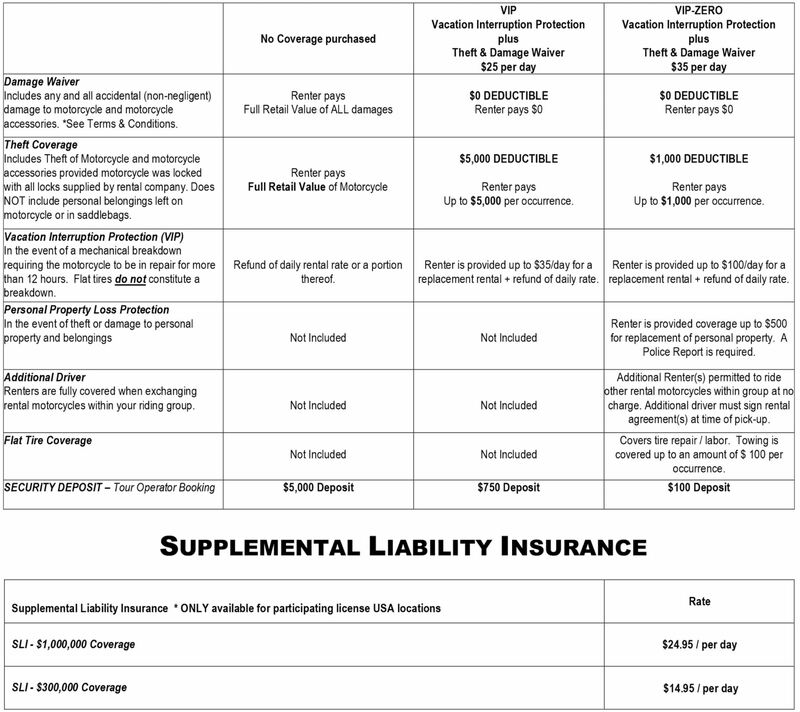 liability insurance coverage and the brochure and/or the Agreement, the terms of such policies shall be deemed controlling and shall supersede the terms of the brochure and/or the Agreement, which brochure and Agreement shall be deemed amended so as to be consistent with the terms of such policies. The parties executing this Insurance & Damage Waiver Addendum acknowledge, represent, warrant and agree that they have had sufficient opportunity to review the brochure and policies. Except as noted above, all insurance, coverage, waivers and/or vacation interruption protection are subject to the express terms and conditions of the Agreement and, without limitation to the foregoing, do not include coverage for injury, personal property, or damage as the result of any violation of the terms of the Agreement and/or the commission of any Prohibited Acts (as defined in the Agreement). A police report is required for all damages or accidents. All damages to rented motorcycle without a police report is considered Renter’s fault.